Tonight, I sit in bed at an inn in Franklin, North Carolina. My stomach is full of beer and pizza, and I could fall asleep in the next three seconds. It’s taking a conscious effort to stay awake. Day 4: due to a sore ankle I decided to take a zero at Hiker Hostel. I spent the day shamelessly reading, napping, and eating pizza. Day 5: back on the trail! The shuttle dropped me off at Woody Gap and I set off on the trail. The stretch of trail between Jarrard Gap and Neel Gap requires campers to use bear canisters, of which I had none. With that in mind I pushed over Blood Mountain through to Mountain Crossings at Neel Gap. 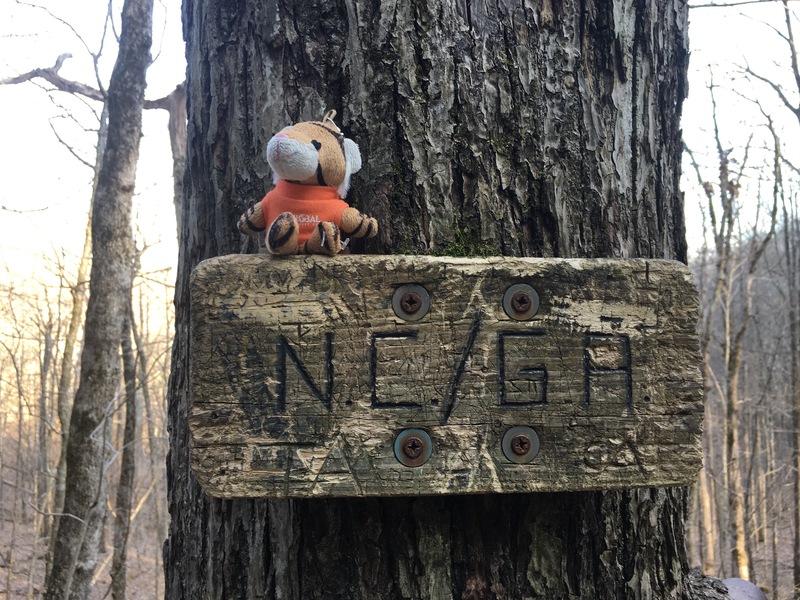 It was brisk and cold, and I had my Buff pulled over my nose and mouth, which prompted several hikers to call me Bandit – thus my trail name was born! 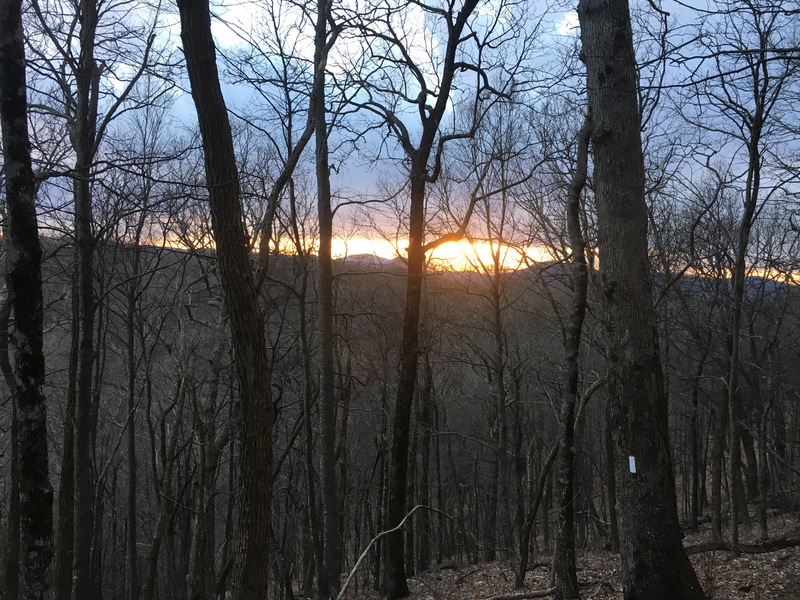 The hostel was booked full, so I secured a cabin at Blood Mountain Cabins and shared it with two other hikers for the night. While waiting for these hikers to arrive, I opted to get a gear shakedown from four-time-thru-hiker Pretzel. The first thing he said when I brought my pack inside was “that’s a very well balanced Mariposa.” I couldn’t stop smiling. The rest of the shakedown went great, and I got a lot of helpful tips on how to effectively pack my pack. Day 6: Upon departing from the cabins, I ran into Pretzel again and we took a quick photo together before I headed on the trail. Knocking out a few miles, I noticed it starting to get very cold. I stopped to put on warmer clothes, and as I did, it began to snow. I grumbled along, complaining that I had left Rochester and the snow behind. 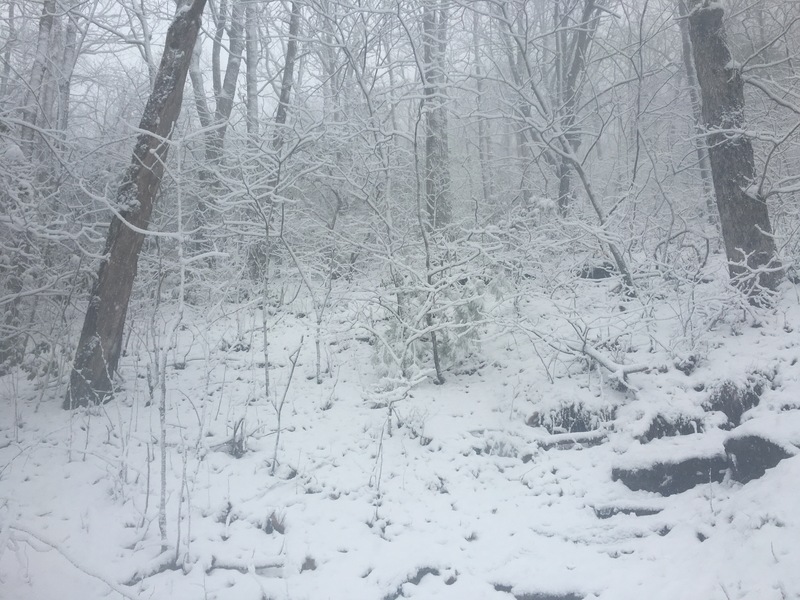 However, my mood quickly improved when I ran into Freud and K. We hiked together, tolerating the snow until it got too much and we were forced to find shelter. I personally wanted to go to Low Gap shelter, but that was another five miles in the snow, so we opted for Whitley Gap shelter, trudging more than a mile off trail. At the shelter, we ran into three 2014 thru-hikers, the Lorax along with two of his friends. 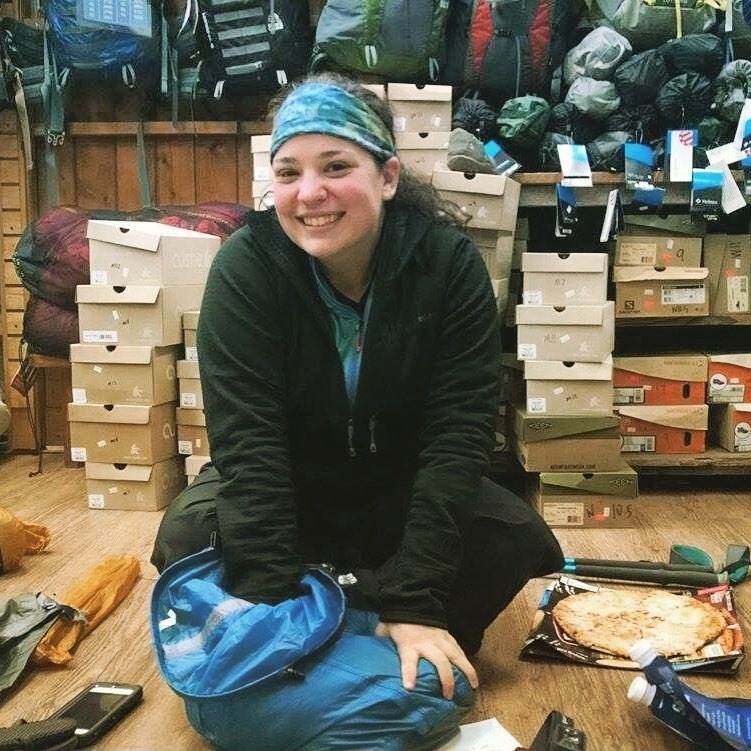 They were doing a LASH before starting their thru-hike of the PCT next month. Day 7: left Whitley Gap and pushed on to Blue Mountain Shelter. The Lorax had warned that the shelter was cold, but someone had thoughtfully set up tarps across the front so it wasn’t bad. I shared the shelter with Freud, K, and the 2014 hikers. Over dinner, I chatted with the Lorax about life post-hike and what I could expect. Day 8: Freud and K let me know that they had a friend coming to pick them up from Unicoi Gap so that they could resupply in Helen, and that I was welcome to join. Taking the opportunity, I hiked 2.5 miles with them down to the gap to meet Amy. She took us in town and fed us, let us resupply, and then dropped me off back at the trailhead as I wanted to get some miles in that day. I raced the sun to TrayMountain Shelter, where I met the 2014 hikers again! The Lorax made room for me in the shelter, and I spent the night next to them. 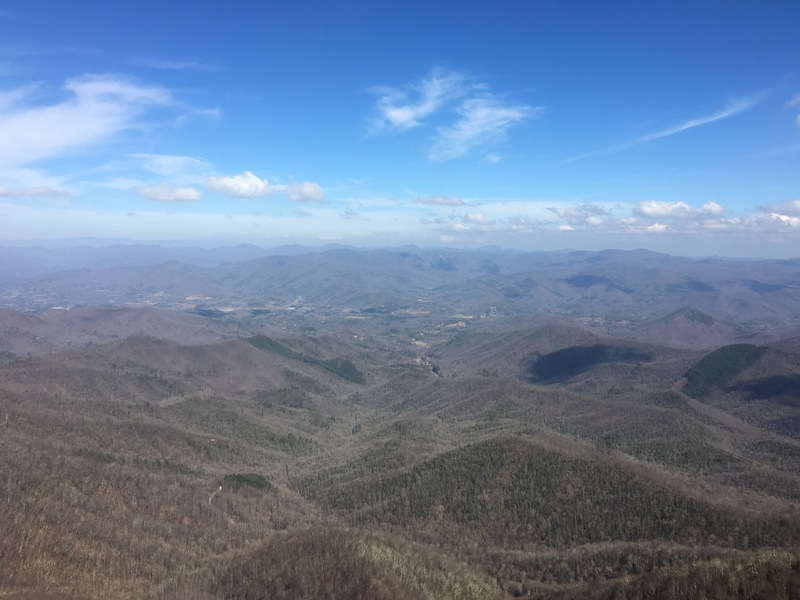 Day 9: I hiked to Deep Gap Shelter. The boys had decided to push on, so I wound up spending the night in my tent, meeting new people. Day 10: I walked home! Which isn’t very exciting when you live in the second state on the Appalachian Trail. I ended up at Bly Gap with Tim, Ian, and some of the guys from the night before. Day 11: I wanted to push to Carter Gap shelter but I was too sore, so I decided to stop at Beech Gap. It was in a lovely grove of laurels and it was a great place to relax. Day 12: I had a sluggish start out of the gap, and I wasn’t feeling myself. My legs and feet were killing me, and after visiting a shelter en route, I slipped on a large rock and landed hard on my knee. Afterwards I was stuck in a negative thought cycle, thinking about how my knee hurt and then that my feet and ankles were hurting, and how I didn’t feel good and that I wanted to sit down. It was hot and I was uncomfortable. The list goes on. Nothing could snap me out of it, until I got to Albert Mountain. From the base to the top it was basically one giant rock scramble which brightened up my mood. I climbed hand over hand, and my mood improved the higher I went. By the time I got to the top I was smiling again. I had also crossed mile 100 on the AT. I hiked on for another two miles to Long Branch Shelter where I stopped for the night. Day 13: I got up bright and early and hiked 3.5 miles to Rock Gap, where I caught a shuttle with seven other hikers to Franklin for our zero today. It was filled with beer, pizza, and shenanigans. A good way to spend my day off! We visited Outdoor76 and I had my footwear evaluated. I decided to purchase new insole inserts to see if they would help with my ankle and foot pain. Only time will tell. I can’t believe I made it to North Carolina in ten days, even with a zero! It doesn’t seem like much, but Georgia was a tough state. I’m so excited to see what the rest of the trail holds for me. I love reading about your adventures! Thanks for sharing and it’s great to know you’re doing okay. I stumbled upon your instagram/website when you first started your journey. I am enjoying reading your adventure and look forward to reading more. Thanks for sharing!! Can’t believe you are doing this! Love reading about your adventures! So proud of you Gina! Love reading about your adventures! Can’t wait to follow along as you go further. Best of luck! What’s a bear can? Don’t you go puttin’ bears in cans!